Does your service club, VFW, restaurant or bar offer pull tab gaming? Do you need a way to securely dispose of excess pull tab tickets? Veteran Shredding offers secure, NAID AAA Certified, onsite shredding for pull tab tickets using our industrial shredding equipment. Our mobile pull tab shredding service is affordable, reliable, and you can even watch us do the shredding! Veteran provides pull tab shredding throughout the Twin Cities of Minneapolis-St. Paul and the surrounding areas, including Scott and Dakota counties. 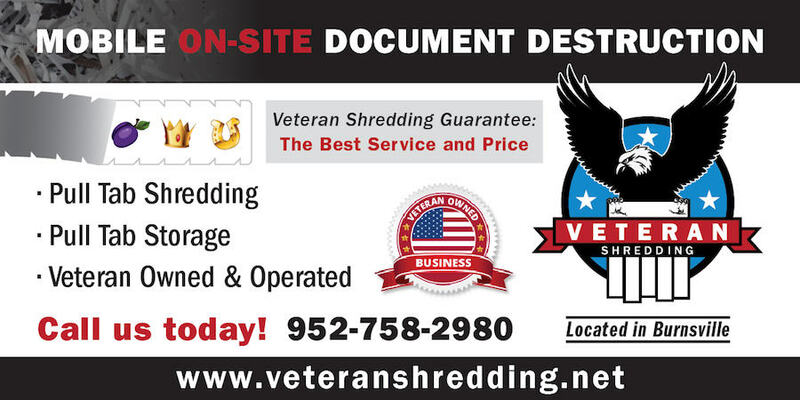 We used Veteran Shredding for our personal residential shredding and they did an EXCELLENT job! They are local and VETERAN OWNED! Thank you to Veteran Shredding for the superior service and for your service to our country! © 2019 VeteranShredding. All Rights Reserved.